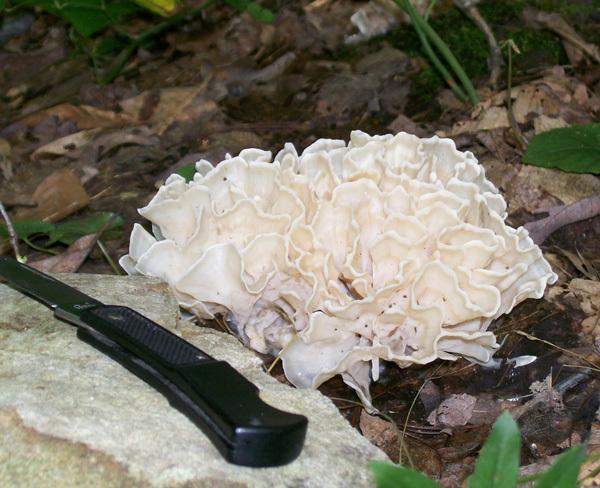 Describing this mushroom is about the easiest there is. It's a great find though when it's young and fresh like the one shown. The best way to describe it is to imagine several cooked egg noodles that are stood vertically on edge, in a curling manner, close to each and which when all arranged has an overall rounded shape. Indeed, if you took the layers of the mushroom apart carefully you will have several mushroom pieces that have the color and shape of a slightly browned egg noodle. When I get an overabundance of the Cauliflower mushroom I like to to prepare the pieces by slow cooking in butter until tender and then package them in small freezer ziplock bags for later use. 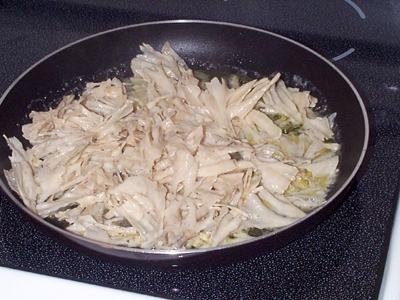 At some point I will use these mushroom pieces in recipes where flat noodles are usually used, like egg noodles. Great in homemade ravioli, chicken noodle soup, beef stroganoff and other such meals where flat noodles are used. 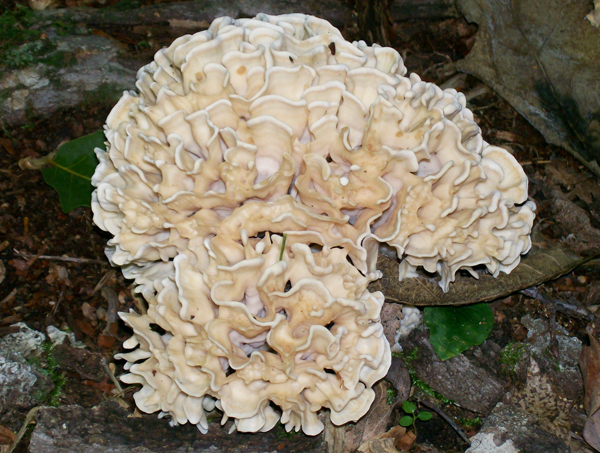 Sparassis spathulata - A/K/A - Cauliflower Mushroom, Eastern Cauliflower Mushroom Chanterelle. DATE - July through August. FOUND - Several found at the base of unknown hardwood tree, probably oak ( no bark to help in I.D. ) in Laurel Hill State Park. Also some scattered specimens at the base of oak trees near a church woodlot near Stahlstown. Weather conditions in the areas described were a bit wetter because of the altitude inherent in those places.